Medicaid in Nevada now covers applied behavior analysis (ABA) for individuals with autism spectrum disorder (ASD). It opens the door for so many individuals on the autism spectrum to access services, and this new benefit supports our mission to help as many families as possible across all populations. Center for Autism and Related Disorders (CARD) is now providing treatment to Medicaid beneficiaries who are diagnosed with autism spectrum disorder (ASD). Beginning Jan. 1, 2016, Medicaid is covering autism treatment in the state of Nevada. Autism treatment using applied behavior analysis (ABA) is key to providing effective treatment for individuals with ASD. Now, over 1,800 low-income children in the state will be able to access ABA. Families who are in need are encouraged to call CARD to start the intake process. CARD also accepts private insurance. 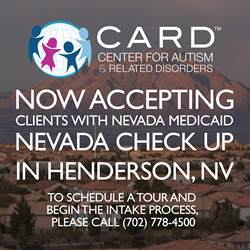 For more information or to schedule a tour of the CARD center in Henderson, call 702.778.4500. The push for Nevada Medicaid to cover ABA came from parents and advocates across the state. Last year, the Nevada legislature approved funding for the program to take effect Jan. 1, 2016. On Nov. 9, 2015, the state increased the Medicaid reimbursement rate from $29.61 to $31.31 per hour to encourage more providers to offer services to Medicaid families. CARD provides a variety of services worldwide using the evidence-based principles of applied behavior analysis (ABA) to treat the deficits and behaviors commonly associated with autism spectrum disorder (ASD). ABA is the only scientifically validated treatment for ASD, and research shows that it is most effective when delivered early and at a high level of intensity. Recognized as a global leader in the field of autism treatment, CARD has treatment centers across the country. visit http://www.centerforautism.com or call (855) 345-2273.